Now when I decided to publish it. futures higher firmwares, for which he wants to try, here it is. - Graf_Chokolo, for their great work. - To Demonhades, for its testing, its great strength. - To JaiCrab, for their help. - To Lara, for making me laugh a day. - People who have tested this 3.56 MA-1, thank you very much. - To all that s @ s who donated for a flasher, no firmware this far along would not exist as such. - To Varicella by their selfless help. - To M.E.M, I NOT forget and NOT forgive. - All I forget that by mistake, apologize. As the first version, it only takes the most basic functions of a custom firmware, now I’ll explain. argued as a simple patch was not just a patch. Support PEEK / POKE lv2, using the typical SYSCALL 6 and 7 for compatibility with existing homebrew. Support PEEK / POKE lv1 native SYSCALL using 10 and 11 respectively. These are used as SYSCALL than the lv2, the devs just have to use them as you would those of lv1 lv2 but affecting. Load unsigned applications, FSELF format natively. That is, a normal application or npdrm FSELF valid format worked directly. (No touch-memory copy in the lv2). Load logically signed applications, both official and unofficial signature valid. Support for applications up to version 3.56. Use of all SYSCALL system, provided that the product no later verify mode, QA, etc. No need to modify the PARAM.SFO in the event that hypothetically would use a application that requests a version higher than 3.56 in either npdrm / normal application / or application running from the bdemu. Installation of Retail and Debug PKG since the PKG Install option. System settings in the XMB QA hacked. Now you can open the options using the normal combo without QA flag is active or a valid token or existing on your machine. Any options changed is maintained in the system registry settings. This QA system hack allows any SPRX to call the XMB to check this information hacked receive information, such as the nas_plugin.sprx, which in the case of DEX would permit installed without any patch of PKG Retail. As always be careful you do with those options, this is the safest way to have the QA without be QA, and not have to modify the EEPROM in any recalculated appearance or tokens of any kind. Here I have to thank Sony for making the security of your token only be in one byte and not in those should be. FIX: Enables the use of all SYSCALL, avoiding generic error 0×80010003. FIX: otherwise is used to integrate the new SYSCALL 6, 7, 10, 11 at lv2. Added support for PEEK / POKE NATIVE at lv1. The method used to integrate these new hypercalls not use hypercall existing one, but really any hypercall not used in the system is a peek or poke depending on the case. To interact with PEEK / POKE, lv2 use SYSCALL of 10 and 11 respectively. Changes in the hypercall mmap (114). In the 3.56 Sony made significant changes in this hypercall to avoid the use that was being given to the lv1 to lv2 mapping. Now this hypercall checks that the key argument has not been modified, are checked mapping ranges (Someone who understands this will realize how dangerous it is that you map the critical thing, and do not speak of lv1) the hypercall code is divided into sub-functions into chunks for rolling the analysis. 3.56 In this version of this hypercall MA has not been touched, but having the support of PEEK / POKE in lv1 mapping is no longer necessary. In a later version is not ruled out such a check hypercall it’s not complicated really, just it was not necessary for this version. Changes in the hypercall unmap (115), similar to mmap, its code shared between subfunctions. FIX: Added some patches to avoid integrity checks lv1 / LV0. FIX: Added patches in the SPM and the DM to enable the use of any service. The patch is different, smaller, the SS patch exists (this is no longer compatible with 3.56), in my testings my patch does not produce any kind of problem with trophies, or saved games, etc..
TODO: Delete the problem of not being able to downgrade to a version lower than 3.56. Currently not possible down from 3.56 after upgrading to the. FIX: Patch to override the check ECDSA digital signature. Now an application with an invalid signature signed will be considered valid. For example, “sign” an application without having the proper private key to generate a proper signature. FIX: Patch that removes the hash check of the application segments. A hash will be considered invalid valid. FIX: Patch to override that you can not use FSELF retail consoles. This patch is different from that in ps3devwiki, the patch is on that page about this subject brickea machines has a problem metadata to decrypt the encrypted executables retail. FIX: Patch to override the protection added in 3.55 (in the case of applications npdrm / normal, previously only was in charge of the RVK) which prevents applications can be used above the indicated version in the firmware today. That is, in a hypothetical case, a game trying to throw in a 3.60 3.56. FIX: Patch to override the protection auth check the applications (added in 3.56), this check detects programs created public tools as they always put the same auth, auth superior one. FIX: Patch to remove the protection from the white list of authorized programs, added in 3.56. Now you can use all applications as 3.55 and below. The lv2 is protected by a hash in lv1, in case you want to play an offset that encompassed in the range of protection, this would produce a panic check off the system. To avoid this problem, use the tool that is attached to this package before using poke modify lv2. Why not to implement this patch directly is because not everyone is dev, and that can not be touched lv2 is safe for the user. Of course the source code of this program is included, so a dev can see how using the POKE lv1 patched the problem. You can now exit of service mode, and use the lv2diag as before, but this has a potential danger. The 3.56 now makes it impossible to make a downgrade to less than 3.56, meaning that if you are in the 3.56 in him are, if you have time you tried to cancel out a version that checks the update manager. The problem is a programming error that allows updating Lv2Diag.self, the failure is that No checks that the update is in the usb or to verify that this is valid, the program formats the flash 1.2 and 3. That is, if then fails, your system would not have died partially flashes, still work ROS can use a lv2diag active again, but who Forewarned is forearmed. Lv2diag Beware! Attached to this package is an updated application to extract the nodes of a dump of lv1 is an update of the application made by Graf Chokolo, now has support for versions 3.15, 3.41, 3.55 and 3.56 in one program. Useful to display the nodes extracted from your dump. 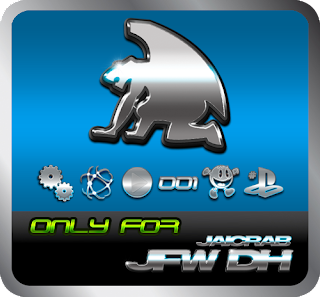 The firmware finished graphic will be added when finished JFW 3.41 itself. In the package adds an application, I do not think there publicly, to put the product model directly from the XMB, acts as a toggle, in the event that you can use the product as simply So I removed the product. As a final note to remember that this is the first version of the firmware, so constructive criticism are welcome. As I suppose that due to this publication where patches are appldr, many variants will come out of it, just remember that the first publication was this. Do not bite the hand that feeds you, today is a 3.56 higher perhaps tomorrow another, or maybe not.